Fotograferad av Christian Johansson. Stor rymlig trea i Göteborg. Öppen planlösning samt sovrum och barnrum. 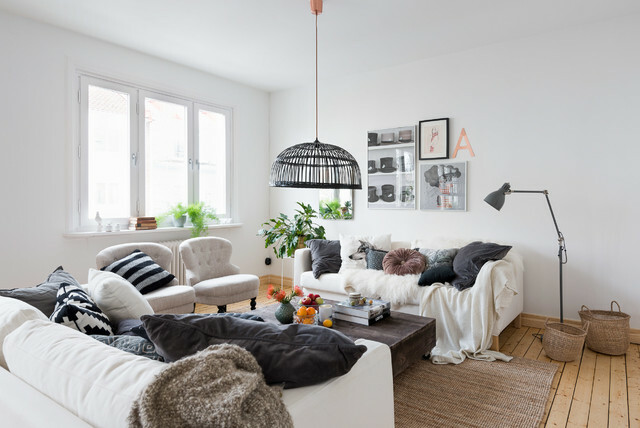 Cherish natureThe Scandinavians are champions of the great outdoors – especially inside the home. Whites and greys may be key design staples in Nordic interiors, but let’s not forget wood. It’s the magic ingredient that keeps Scandi style warm and inviting, even while broadly cool in tone. So bare those floorboards, or add timber in the form of furniture or accessories, such as picture frames or bowls. Houseplants – not, of course, those featuring brightly coloured flowers – will also soften a minimal space. Layer up with vases of pale blooms, wool and jute rugs, rattan, battered leather and natural stoneware – and enjoy the feeling of slowly exhaling as you survey your relaxing surrounds.